Live radio programs hosted by Strip hotels are here to stay. The trend of Strip hotels hosting live radio programs is one that doesn’t seem to be going away anytime soon. Strip hotels are known for a wide variety of attractions — mainly casinos, restaurants, nightclubs and shows. However, it’s a recent trend that’s accomplishing the hard to do — getting locals down to the Strip. “In traditional radio, when you are in your car, it is a very contained experience,” says Tim Moungey, spokesman with Tickle Me Entertainment, a public relations and event planning firm that works with the popular “Old School by the Pool” party hosted by 105.7 FM at Kahunaville restaurant at Treasure Island. The event draws about 800 people every Friday. “Broadcasting from a casino gives you a larger area to work from, and instant feedback and interaction with your audience,” Moungey say. 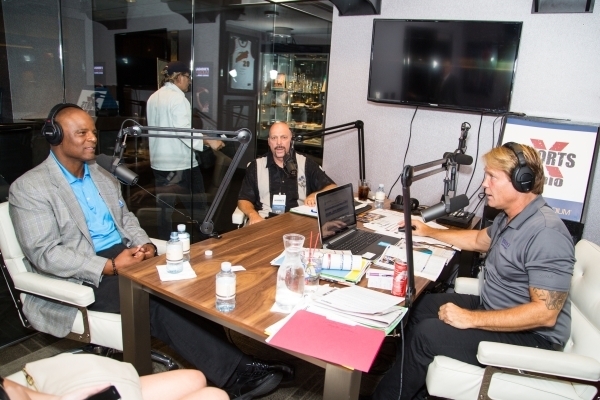 The latest major Strip hotels joining the radio broadcast partnering trend is The Venetian and Palazzo, which just celebrated the grand opening of a new broadcast studio with Yahoo Sports Radio, with a star-studded event July 15. Actor Rob Riggle joined Pete Boyd, Venetian/Palazzo senior vice president of operations, and Ken Thomson, Yahoo Sports Radio’s Sports X Radio program host, in cutting the ribbon at the grand-opening ceremony. The addition of a live remote broadcast from a Strip hotel makes for more dynamic event programming, with the radio broadcasts often being tied into other hotel resources and attractions. The ability for radio broadcasts to be streamed online to anywhere in the world has given the hotels a new level of brand awareness from these media partnerships. The Venetian and Palazzo’s partnership with Yahoo Sports Radio allows it to reach all 500 of the Yahoo Sports Radio stations across the United States, further branding Lagasse’s Stadium as a place for the young, hip and trendy, while showing the hotel’s philanthropic side. Just two weeks ago the resorts hosted basketball star Chris Paul’s charity table tennis tournament, and as part of the grand opening of The Palazzo Broadcast Studio, a partnership was announced between basketball player C.J. Watson’s Quiet Storm charity foundation and Sands Cares, the global citizenship program from Las Vegas Sands Corp. A $10,000 donation was made to fund 10 individual scholarships. One brand that has had to constantly reinvent itself with the help of both radio and hotel venues is the weekly 105.7 FM “Old School by the Pool” party, a staple for almost a decade. This longtime radio event is enjoying a resurgence in popularity in 2015 with a format change, and it is being hosted by longtime Las Vegas rhythm and blues singer and entertainment personality Phil Flowers. “Instead of circulating the same three or four bands that everyone knows, we feature a surprise local lead vocalist each week, and then all the other local vocalists attend because they are waiting for a couple of minutes of open mic time to showcase their skills,” Flowers says. In less than a year, “Old School by the Pool” has transformed itself from a predictable weekly party with a radio presence to an interactive showcase of vocal talent, funk and rhythm and blues music from the 1970s and 1980s. A newly located dance floor that places dancers in front of the band at Kahunaville — and not across from the band, separated by water — has dramatically increased the energy at the event. The result is the most popular weekend event at Treasure Island since Tangerine nightclub closed almost a decade ago. Another major Las Vegas hotel venue that is packed on a weekly basis in part because of live radio promotion is Westgate Resorts’ Football Central hosted in its showroom and promoted with ESPN radio 1100 AM. Every Sunday from 8 to 10 a.m., during the regular season of the National Football League, popular sports radio personality Mitch Moss broadcasts live from the Westgate sports book, the largest sports book in the world. Both the ESPN Radio broadcast at the Westgate and the 105.7 FM “Old School by the Pool” program at Treasure Island do something that is thought of as nearly impossible by many Las Vegas hotel industry insiders — they get locals to make the trip on or near the Strip. “We give a lot of locals the opportunity to watch their favorite team without all the packed crowds that are all across the Strip,” Kornegay says. A packed crowd is what guests of the “Old School by the Pool” party anticipate, but the new event features have locals coming out in droves to see what is next.